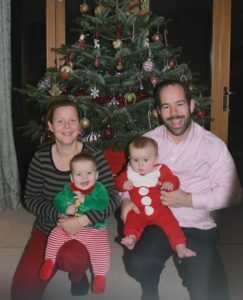 After three miscarriages, Katherine and Daniel from Essex cannot wait to celebrate their first family Christmas with eight-month old twins George and Thomas and their wider family. The couple first started trying for a baby five years ago but when Katherine hadn’t conceived after more than a year they went to see their GP. “The doctor put me on Clomid and when I still didn’t fall pregnant we were sent to our local hospital for tests,” reveals Katherine. 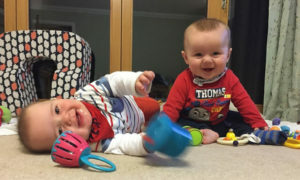 Katherine and Daniel were told that they could be referred for IVF treatment and they opted to go to Bourn Hall Clinic. Over the next couple of years Katherine sadly had three miscarriages, twice following IVF treatment and once after a surprise natural conception but despite their setbacks Katherine says that she and Daniel did not give up on their dream of having a family. Intralipids are known as an adjuvant treatment, something that seems to work in practice but doesn’t yet have a scientific evidence-base. Intralipids are derived mainly from soya protein and eggs and are administered using a drip. It is thought the treatment makes the environment in the womb friendlier towards the embryo. It has been found by some patients to be beneficial after recurrent miscarriage but this is not proven. The couple were ‘cautiously optimistic’ when Katherine fell pregnant for a fourth time but tried not to get their hopes up too much because of the previous miscarriages. Happily the pregnancy went full-term and George and Thomas arrived on 27 March 2016. Christmas will be a real family affair with both sets of grandparents joining in the festivities. “It will be the best Christmas ever,” says Katherine. Intralipids is one of the additional treatments Bourn hall offers – read more here.